As I mentioned on Saturday, The Verdant Gryphon brought back my beloved Zaftig yarn (worsted weight MCN blend) and I just could not resist. 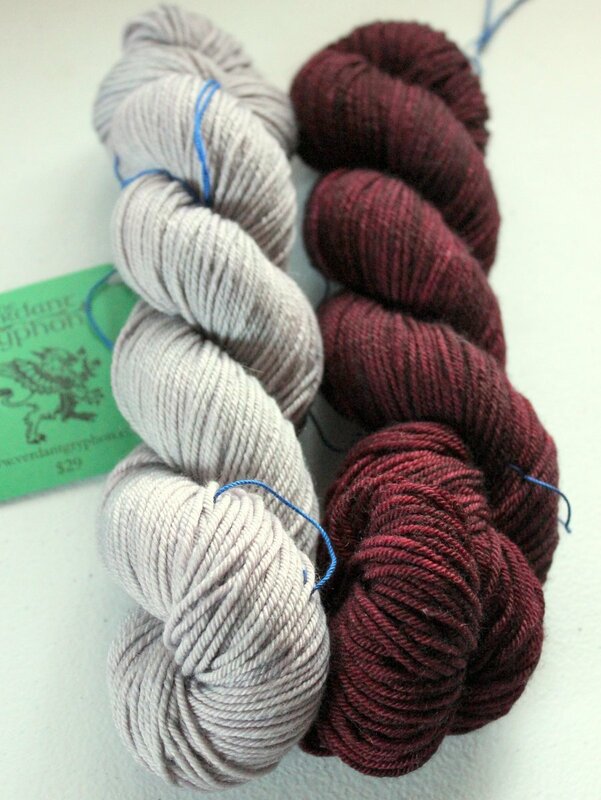 Skeins were acquired, and swatches were nearly immediately made. The beginnings of a Lucy Hat. Click for project page. Hats are my absolute favorite instant gratification project, and normally around this time of the year I’m knitting hats like crazy for gifts. However, this one’s for me, and it’s going to be awesome. SG Codex, colorway Lioness of Brittany. Click for project page. The project I’ve been (mostly) monogamous with is my Sweet November shawl knit with luscious, silky Codex. I know I’m going to love this thing like crazy when I’m done, it’s just not particularly engaging to knit anymore since it’s quite simple and repetitive. But that ball is shrinking quickly, so an FO should be in my future soon enough! Inglenook Batts. 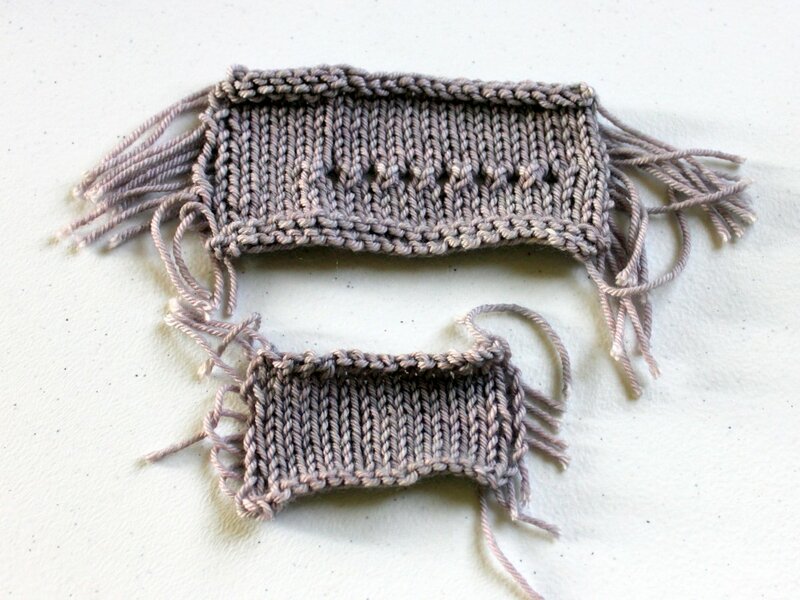 Click for handspun project page. I took a little spinning break after Spinzilla, but have since picked up my supported spindle project here and there. I’m still enjoying this spin. The singles are so colorful and such a crazy mix of fibers that I’m really looking forward to seeing what it will look like plied! Over in the Spindlemania group there has been some discussion about how people store their spindles. The above photo illustrates my little spindle corner in the living room. If you look closely, you’ll spot two Turkish spindles on top of the tallest bookcase (one of the few spots in the house that Darwin can’t terrorize). Hanging on the wall are two colorful bags that each contain a top whorl spindle (my Golding and my Kundert) with their fiber. The small hanging bag holds fiber for one of my support spindling projects. Below the bags are my two support spindles and one additional top whorl stuck in a vase with glass beads to hold them upright. For traveling, my Jenkins Aegean and my larger Capar Turkish spindles each fit well within my Dakine school supply case (with shafts removed and with plenty of fiber). 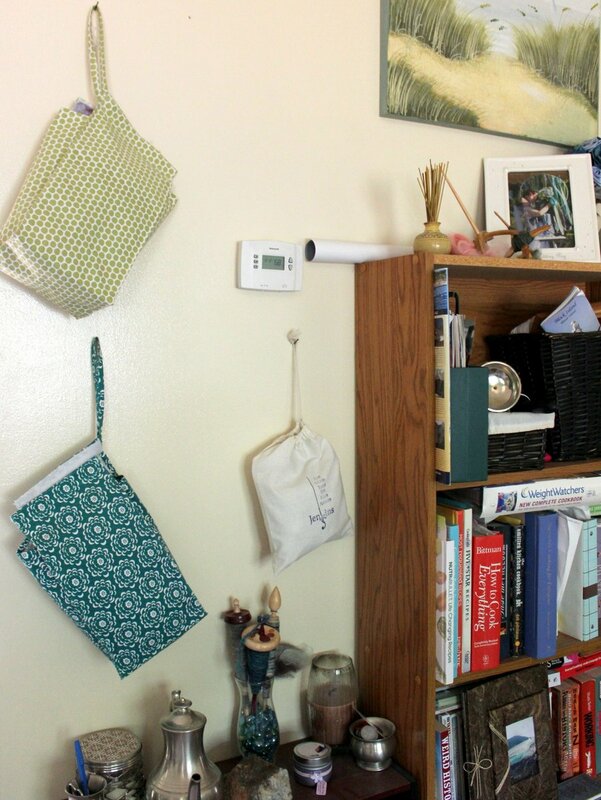 How do you store or travel with your spindles? What do you do when the urge for instant gratification strikes? This entry was posted in Bugga, hats, shawls, spindles, VerdantGryphon, WIPs, WIPWed and tagged knitting, spindles, spinning, WIPs, WIPWed by shoelaceswitcher. Bookmark the permalink. 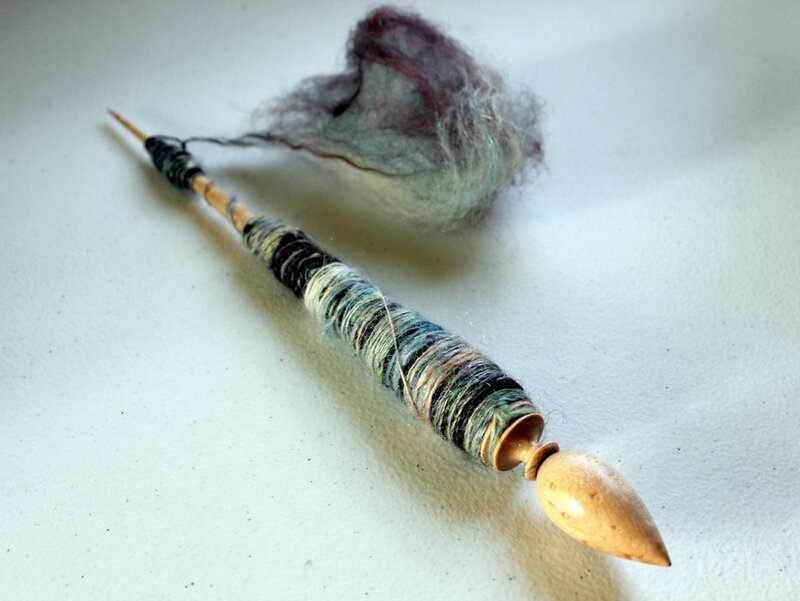 I love the handspun, someday I definitely want to try one of those spindles, especially so I can work with some cotton. Love your new yarn buys as well, but then again I always love them! I bought a hipstrings tahkli for cotton, it’s quite interesting to spin! When the urge to cast on for something new strikes, I go with it. Nothing is more fun than giving into your creative impulses. Awww, thanks, and i agree! Why deny your creativity, right? I love your little fiber nook…. it’s making me miss mine! As for instant gratification, I’m all about hats. I actually cast one on last night. Although this time around it’s less about instant gratification and more because I was a real dummy and only brought one hat with me to NZ, thinking that a Wellington spring would be like a Californian one. It isn’t. My one hat got wet on a particularly cold and rainy day. Someone here thought it was funny that I thought it was faster to knit a new hat than go look for one to buy it. Oh dear! It might not be faster but it’s about as fast as it gets so i understand the impulse! I like a ‘quick’ knit in between larger projects. Lately, however, I’ve been pretty monogamous. It’s a strange thing for me. I’m certain it won’t last. I have a lot of catching-up to do. Maybe once I get that out of the way I’ll start to loosen up and cast-on ALL THE THINGS some more. Your hat is going to be lovely! It’s a great color combo. Thanks! I’m really diggin’ that wine color this fall. Seeing I only have a couple spindles, they all hang out in my main spinning bag. But I love your organization! I also love that you are making a hat for yourself – I love hats as instant gratification also.